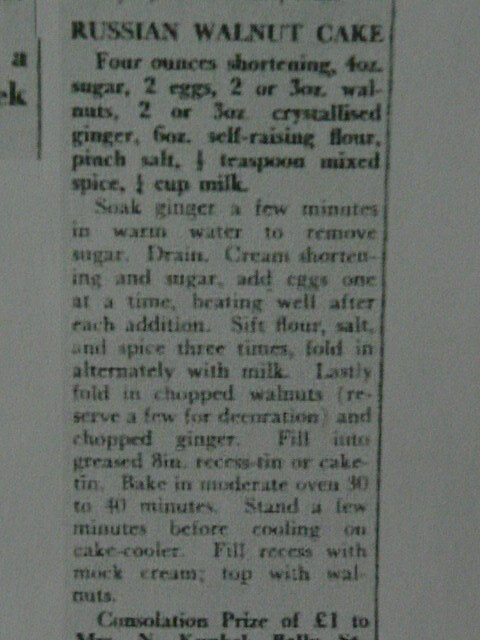 Yesterday I had the opportunity to search Trove http://trove.nla.gov.au/ and found that my mother had won £1 submitting her recipe for Russian Walnut cake in 1952. On the flip side I could not find the picture of our wedding that I know was published in the AWW (in an indexed year)….more follow up is required. My husband’s grandmother had suggested to them that they photograph us and I suppose that being “exotic” and going to the Territory of Papua New Guinea to live was enough to get us a photographic guernsey. What I did find was a great story about the wedding of a couple (Hayward-Sawtell) who marriedin 1969 at Dagura Mission, relatively close to my future husband’s residence in Alotau. It was such a classic story of how difficult everything could be to achieve in those pre-internet, pre-access days. It reminded me so much of our early married days and our first Xmas together in PNG when the plane with the Xmas food was circling overhead looking for a gap in the clouds -at lunch time on Xmas Day! A mad dash to the airport meant everyone’s menu rapidly expanded. Life in Milne Bay (where battles were fought in WWII some years earlier) was nothing like life in “normal” Australia in the 2oth let alone the 21st century….an experience and memories to be treasured. Another little snippet from the newspapers online was my father winning a “most original” prize dressed as a baker at the local Fancy Dress Concert when he was nine years old. These are the snippets that you’d never find searching the old-fashioned, slow and painstaking way, unless you were really lucky!